About a month and a half ago, my buddy Scott Wyden came up with the idea for Self Portrait Friday. * The idea is that every, or at least any Friday, you take a self portrait, probably just using your camera phone, maybe with one of the fun smart phone photo apps, and post it directly from your phone to Twitter using the hashtag #selfportraitfriday. It’s been a fun thing, and it’s a nice way to end the working week. You also do not need to be a serious photographer or have a photoblog to play along. My entry today was not originally taken with a camera phone – I did use my Nikon D700 for it, but I created this word photo using an iPhone app called, appropriately enough, WordFoto. 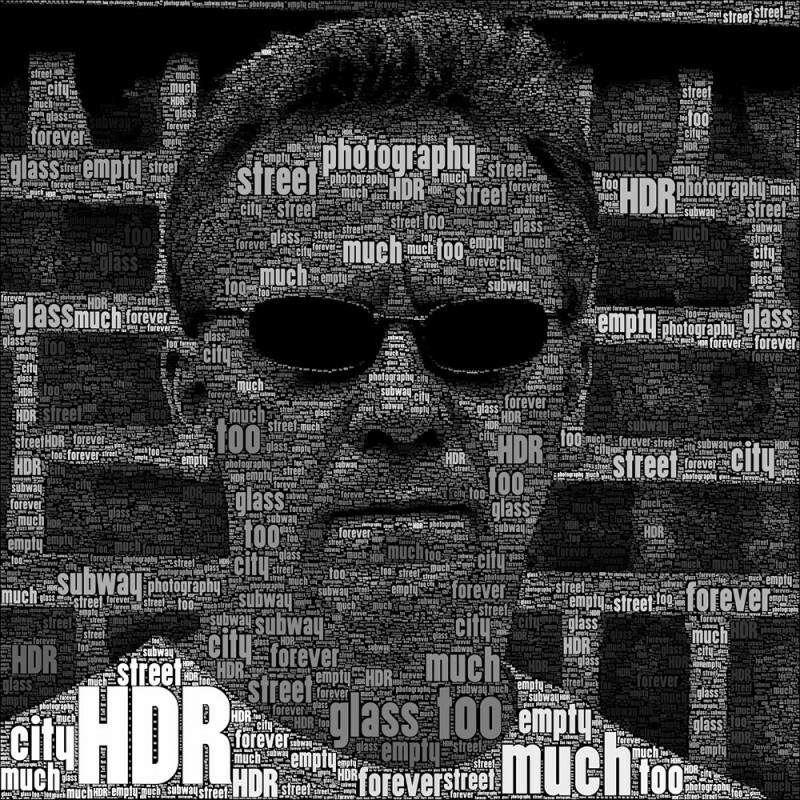 It’s a paid app, and of limited use, although pretty much most iOS photo apps are like that I suppose, but I had fun creating this word version of my self-portrait with it. You can use any set of words you want, but you have to type them in one at a time – there’s no way to import a text file or have it generate the text from your blog. That’s fine, because you probably don’t want to use more than 10-12 words anyway. I basically used the name of my blog, the name of my book, and a few other words that are descriptive of my blog, and applied it to the image I use as my Twitter avatar. The link below is an affiliate link, so I’ll get a penny or two if you purchase through it. * Scott soon discovered that someone else had created #selfportraitfriday earlier, but it had fallen into disuse, and Scott seems to have both independently created the idea and revived it to the point where twitter apps now include #selfportraitfriday in their auto-suggest features once you start typing it. That app did a fine job of creating a word mosaic that works well with the photo. I may have to look into this as a fun app to mess around with. This rocks! I’ll have to see if it’s available for Android! Pretty cool idea for a self portrait. Very cool Mark, the app did a great job I like it a lot.